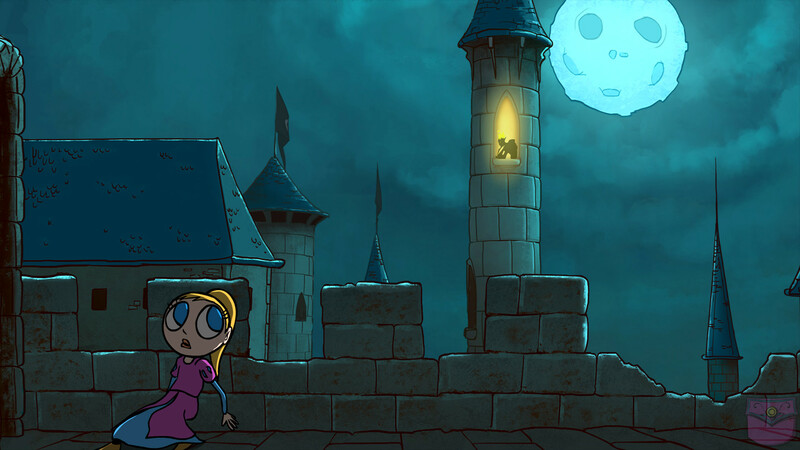 Tsioque is a tale of a brave princess and a kingdom in distress, manifested as an adorable adventure game. Welcome to Tsioque and to a kingdom of crescent and double star. Here lie a great story and an adventure you won’t forget any time soon. It all started more than three years ago with a collaboration between OhNoo Studio (Tormentum Dark Sorrow) and Smile Studios. They launched a Kickstarter campaign together and gave birth to Tsiouqe – a frame-by-frame 2D point-and-click game that swooped me off my feet. 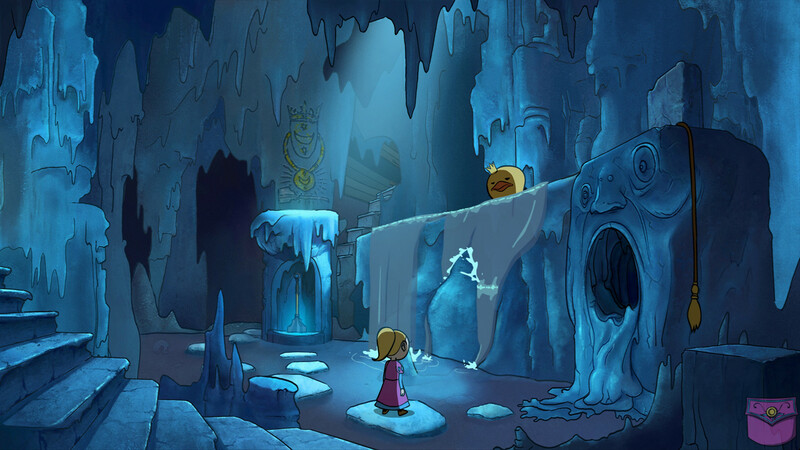 The story tells of a kingdom ruled by a golden-haired queen, who happens to be Tsioque’s mother. Alas, a wild, burning phoenix attacks the realm, and the queen must depart to defend the whole kingdom with her army. The royal wizard seizes the opportunity and takes over the castle and throws little Tsiouqe to the prison. But, as the opening sequence notes, more than one lock is needed to get rid of Princess Tsioque. This is where things get dark. When you begin the game itself, Tsioque is in a bad situation. She is locked in the dungeon and watched by a guard that gets angry if she gets too noisy. Breaking out of this cage will the first step in your journey to escape the clutches of the vile wizard. 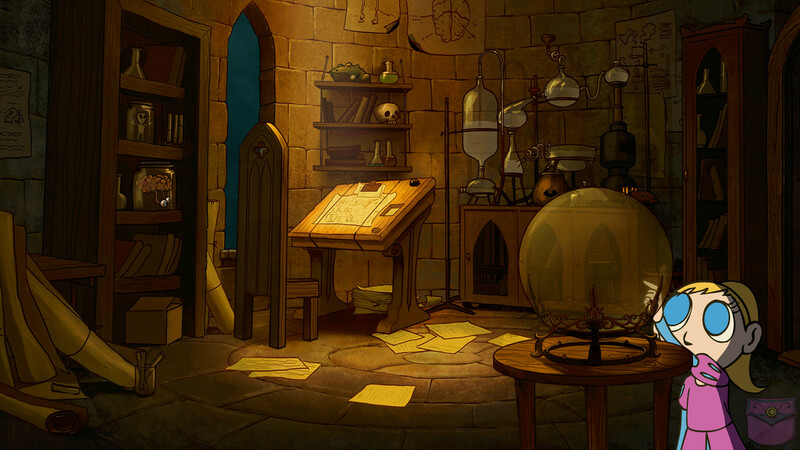 On your way, you’ll unravel many secrets hidden in your ancestors’ castle. Tsioque herself looks absolutely adorable. She has large blue eyes, a blonde ponytail, a pink dress… and a constant frown. She is clearly upset with the situation she’s in and has every intention to rebel against it. Truth be told, this angry look makes her even lovelier and cuter. The mage, on the other hand, is cold and bitter. He is clad entirely in black, except for his fire-yellow hair. It seems that throughout the game all he really wants is some peace and quiet – the very same thing Tsioque refuses to give him. The wizard’s minions, aka the guards, come in all shapes and sizes. They all look somewhat like dark and ugly elves, mostly with long pointy noses. They patrol all around the castle, so you need to be careful not to get their attention. You’ll roam around the castle, try to be as unnoticeable as possible so the guards or the wizard will not spot you. If they do, you’ll find a bunch of rusty weapons inches from your face, and you’ll go back to the last checkpoint. 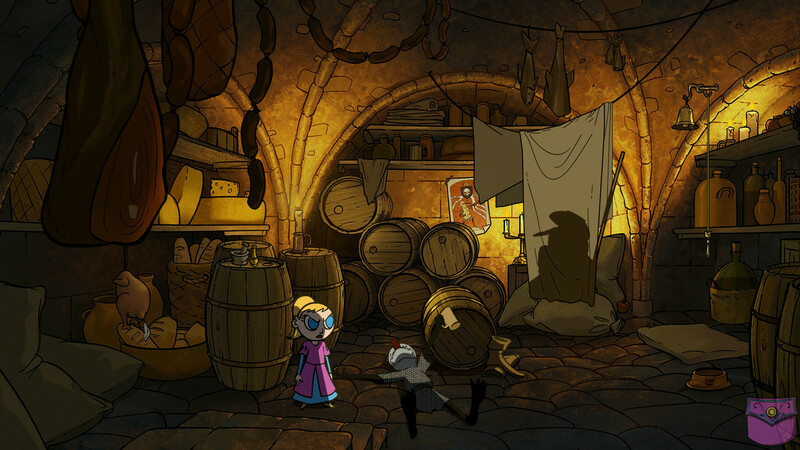 Although it may sound like one, Tsioque is not a stealth game, but a point-and-click adventure title. You point, you click, and you collect many different items. Items go to a little bag, and you can get access them at almost all times in order to solve puzzles. Fairly standard stuff, really. Another aspect of the gameplay is these little mini-games, most of them are all about timing: click the right place in the right time. Laptop gamers should probably come prepared with an external mouse or these mini-games will be a little difficult to complete. Sometimes your course of action will be obvious, but sometimes you’ll have to struggle a little bit to figure out what to do. It is not all dark and gloomy – Tsioque also has plenty of humor. I often found myself laughing and smiling at a witty comment or a reference to a known piece of folklore. The humor is embedded in everything – the design, storytelling, and sound. Some of the jokes even manifest themselves as Steam achievements. The game has several phases, divided by the narration of a royal announcer, which fits perfectly with the game’s themes. The text even rhymes, and while some rhymes are better than others, the writing is nicely done. The visual design is absolutely wonderful. Every screen contributes to the dark themes of terror the game tries to induce and provides a comic relief when needed. At a certain point, the scenario changes drastically (I won’t tell you when or what – just play it! ), and the artwork’s impact is even more significant. The soundtrack is also great and fits the vibe of each location. I especially like a particular instance where you need to time your actions perfectly with a score that’s designed to complement every click. Tsioque is a short game that can take anywhere between one to 4 hours to complete. But these are hours well-spent, and if you have the time, don’t hesitate to help Princess Tsioque save herself.